The idea being that if a student performs poorly at the beginning of a course, but puts in the work needed to catch up and learn the material, they should be assigned a mark that reflects their current ability and knowledge in the course at the end (despite the fact that they had a rough start). An average will negatively impact this student by always pulling their grade down due to the low marks early in the course. All 3 students have the same average. But when asked “which student would you want to pack your parachute?” I believe we would all have the same answer. 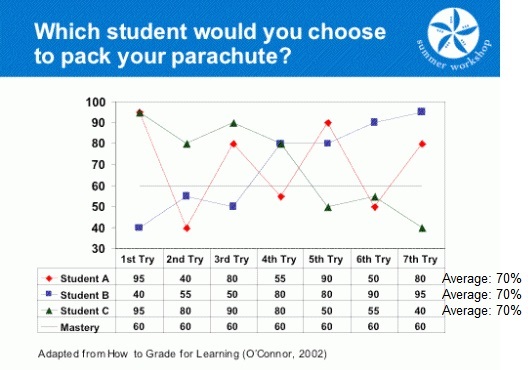 So clearly, an average does not always give us the most accurate picture of student achievement. Below is an example of an evidence record for a math course. This would be printed out as one page per student. 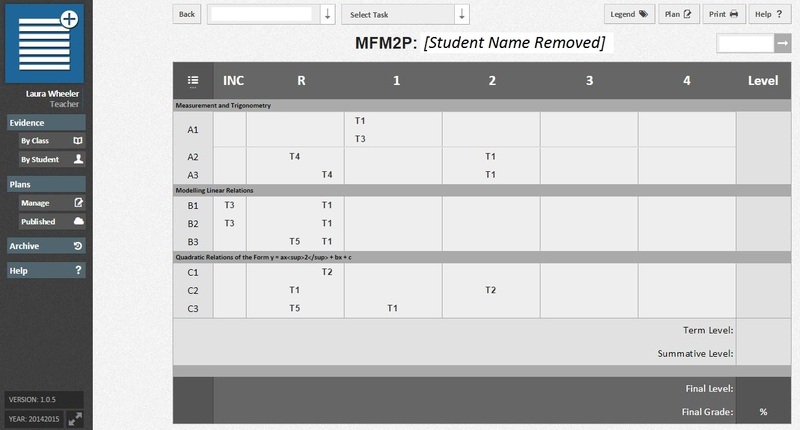 It does mean a binder full of these sheets in order to track a student’s grade and progress. Some teachers are not keen on these being a paper-pencil tool. There are electronic versions of evidence records starting to be made; the OCDSB is piloting the online MaMa+ version this semester, and Bruce McLaurin over at Glebe C.I. has created some excel spreadsheets that self-populate the marks into evidence records for you. However, I have found that trying evidence records for the first time with pencil and paper gives you a much better feel for how they work & what they represent. I find that by handwriting a student’s achievement on to this paper record, I notice trends in the students’ marks much better than if I were relying on a program to create the evidence record from my class list of marks. Update (2014.12.04): This fall, OCDSB teachers have access to the MaMa (Marks Manager) software online which allows us to keep electronic evidence records. Here’s a video clip explaining how to take the levels of achievement earned on the test and record that on your evidence record. 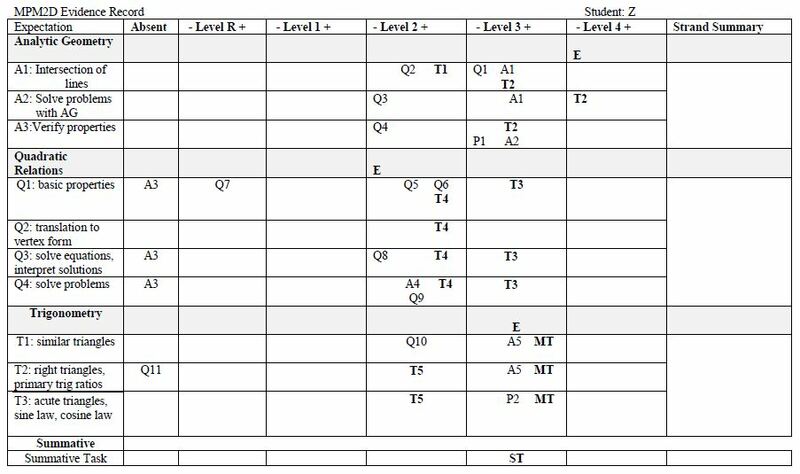 We can see, for example, the students quiz marks (code Q) and test marks (code T). Each code may appear in more than one row because a test can evaluate multiple expectations. 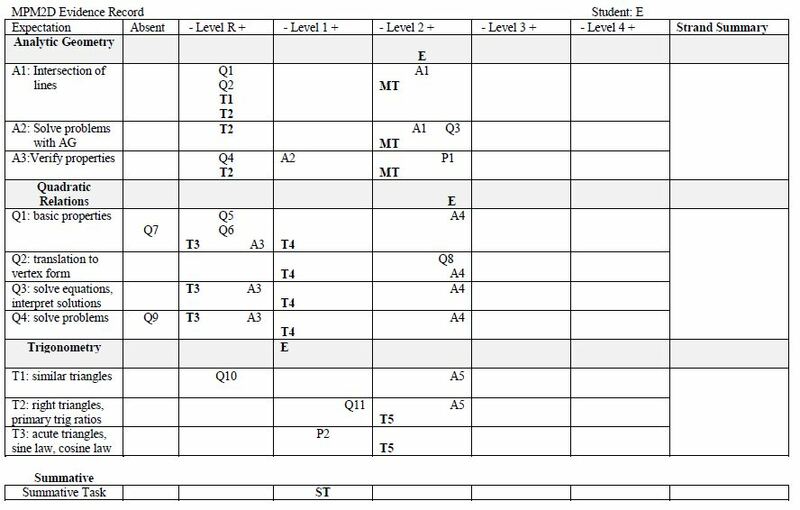 The numbers attached to each code indicate the chronological order of the tests: T1=Test 1 and T2 = Test 2. The exam mark has been labeled with code E in the grey row above each strand. Notice the exam receives 3 separate marks; one for each strand of the course. The summative, code ST, has been recorded in its own row below the term work. 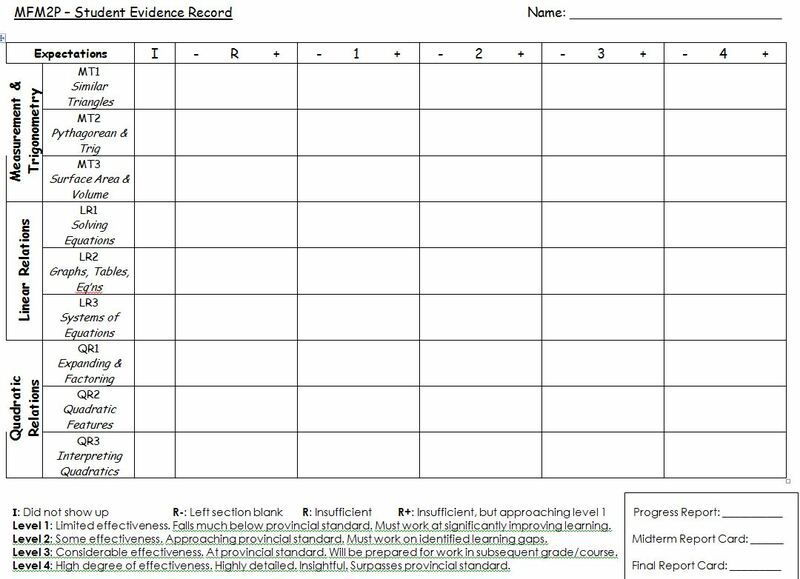 What final level of achievement would you assign to the student with the above evidence record? This is the type of moderation I have teachers try when I offer workshops to my colleagues about this new A&E. I find it really useful to hear my colleagues interpret the evidence presented, and comforting to see how consistent we usually are in determining a final grade. 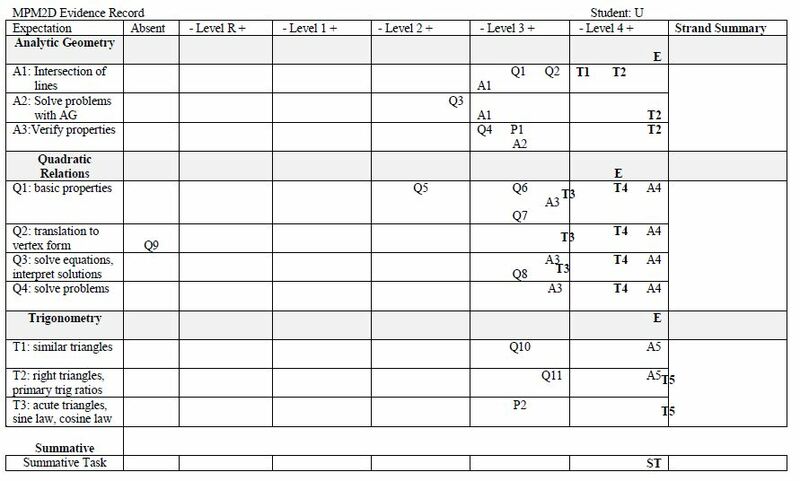 It’s not ideal to be converting the levels back to percents in the old style, but it will do until the Ministry changes report cards to match the levels of achievement from their curriculum documents. Here are a couple more completed evidence records to look at and practice determining an overall final grade. Note that MT is Makeup Test. . . . . and another . . . The more familiar we become with this template, the more conversations we have with our colleagues, the more comfortable we become with using our professional judgement in order to determine the student’s final grade. This professional judgement replaces our reliance on software that calculates averages for us that feel accurate, but that I don’t think are any more accurate than my own well-informed professional judgement (but that’s a conversation / debate for another blog post!). The End! But it’s only the beginning . . . So here we are at the end of my blog series about the new A&E in the OCDSB. It’s really only the beginning; this process will evolve as we implement it in our classrooms. We’re learning how to best use these templates in order to inform not only our evaluation practices, but our instructional practices as well. How are you feeling about the new A&E? Start a conversation with your colleagues in your school or in your department. I would love to hear your comments, questions, concerns . . . Leave a comment below or get in touch via Twitter!